We believe the continued pricing pressures of 2018 are easing as continued negotiations with US trade officials have everyone in high hopes for a suitable and equitable outcome. 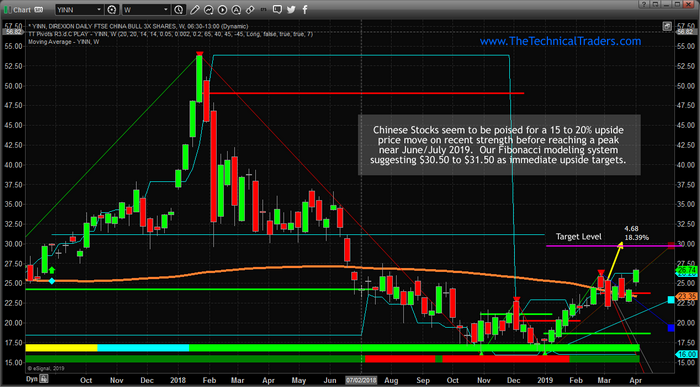 Our researchers believe the upside in the Chinese stock market could be as high as $32 to $36 in YINN before the June/July peak is reached. This would represent a +25% to +40% upside price objective from recent highs. It is our belief that the continued US/Chinese stock market rally that initiated after the December 24, 2018 bottom will continue until a June/July 2019 peak is reached in the global markets. Pay attention because this could be an excellent short term price move for skilled traders to pocket 10% to 20% over just a few days or weeks. Another pocket of stocks also starting to breakout are small-caps which I shared in a detailed technical analysis video last week. While we have suggested the US stock market is poised for further upside price activity with a moderately strong upside price “bias”, our research continues to suggest the SP500, DOW, NASDAQ stock markets will not break out to the upside until the Russell 2000 breaks the current price channel, Bull Flag, formation which is why I am starting to focus on small-cap stocks using my MRM Trading Strategy. Please visit TheTechnicalTraders.com to learn more about how we help our members learn to find and execute incredible trading opportunities. We’ve recently launched a new technology solution for our members that delivers our incredible research and trading solutions. 2019 is going to continue to be an incredible year for skilled traders or those who follow our analysis – you won’t want to miss these big moves that are setting up.